Everybody keeps secrets, right? Everybody’s living a lie to one extent or another. The three women in Cross Her Heart are all lying about something to their nearest and dearest. Marilyn pretends she has a perfect marriage and supportive husband. Ava, 16, is texting an older man on Facebook, convinced that she’s truly in love for the first time, planning to meet him, and not telling anyone. But it’s Lisa, Ava’s mum, who’s hiding the most explosive secret of all, one that will nearly consume them all when it’s revealed. You think you know from the beginning what her secret is, but you are wrong and there are still layers to get through and more twists and turns than you imagined. Settle in for the ride, and if you can, turn off your phone and carve out some time. You’re not going to want to put this book down. Lisa and Marilyn work together and have become best friends over the years. Lisa’s not interested in dating at all, focusing instead on raising her daughter, but a new client named Simon has her reconsidering her tough stance. Marilyn shows the world a good face and a stable marriage, but you soon find out it’s a facade to cover up violence and degradation. Ava, meanwhile, is a typical 16 year old in many ways. She’s got three close friends, all of them avid swimmers, but she’s closest to Jodie, several years older and already at university. The two bond over their “weird mums”–Ava’s over-protective, Jodie’s strangely absent. When Ava rescues a toddler from a fast-moving river, Lisa runs to hug her, someone snaps a picture, and suddenly their lives are upended. It’s going to take all of Lisa’s intelligence and street smarts, and all of Marilyn’s fierce and complicated love and trust, for them to even survive. 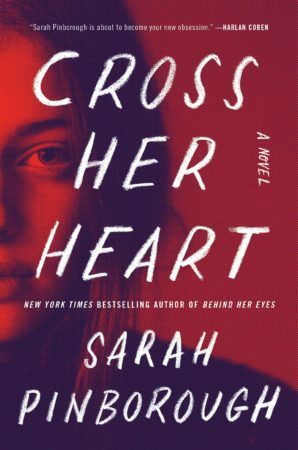 Cross Her Heart is a psychological thriller that keeps you guessing through its twists and turns. The characters are relatable and the plot is twisty enough to satisfy the most discerning reader. Seriously, block out a few hours to enjoy this one!